You are here: Home>Topics>Transport>My Memories: The Garden City Railway. 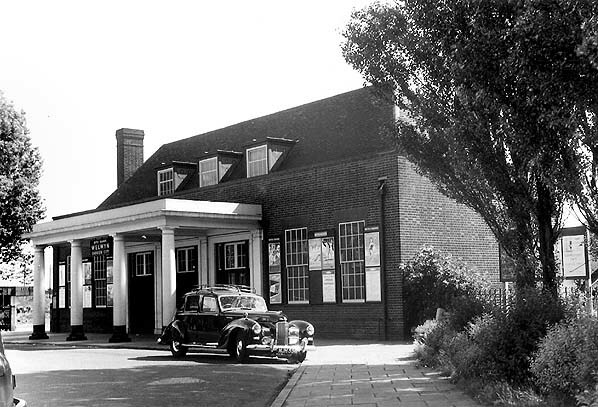 1953 - The ticket office at the old Garden City railway station which had a car park to its' left, and was demolished in the late 1980s to make way for the Howard Centre. As explained in the text, I used to go in here to buy my railway ticket before going over the footbridge to Platform 4. 1956 - The actual rails with Platform 2, 3 and 4 in site. 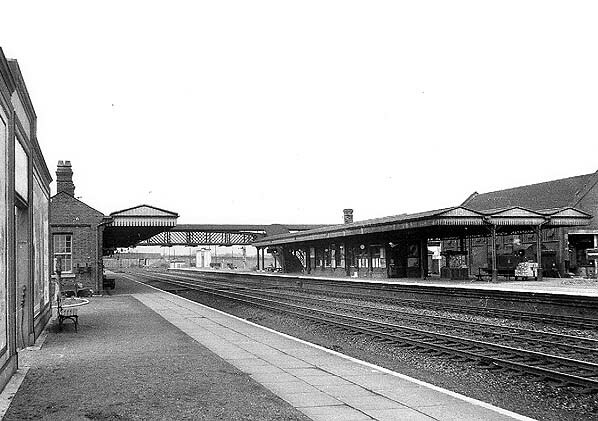 Platform 1 (not seen in this) was the Hatfield-Dunstable line and Platform 4 was the Hertford-Welwyn Garden line (which was not used after 1951 but a goods service continued on the line until 1966). Platform 2 and 3 were for the mainline lines to/from London. My first memory of the Garden City railway station is when I was 3 ½ years old (May or June 1945), very near the end of the Second World War. It was a weekend, and my parents took me past the Shredded Wheat factory then up the stairs onto the bridge that overlooked the railway. My dad held me in his arms and showed me as the steam hauled locomotives went through or stopped at the station, and said that Mum came to the town on one of them. We were there for half an hour, and then went and enjoyed a nice drink at the Parkway Restaurant in The Stores. I used the railway a lot more after that. The railway station (or train station) had and still has 4 platforms, and in my day Platform 1 was the Hatfield – Dunstable line and Platform 4 was the WGC – Hertford line (which closed in 1951 to passengers). The ticket office was taken over by the Howard Centre in the early 1990s but the original tracks remain used by many train lines. I still live in the Garden City, but I can’t say I’ve been here all my life as that’d be false but for the time I lived here the trains were well-used. After I started Ludwick School in September 1947, my parents would allow me to ride a train alone. I felt free at last!! Every August after that, Mum would take me to the railway station early Monday morning and I’d buy my ticket to Hertford North (or Stevenage post-1951) and then go to Platform 4 to wait for my train. The passenger service for Hertford departed the station every 40 minutes, 20 minute journey. After 1951, I used to ride the train to Stevenage (20 minutes) then ride the train down to Hertford North (25 minutes). My taxi would be ready + waiting for me in the station’s drop off and pick up zone – my Uncle Teddy of whom I visited over the Summer ran a coach + taxi business and always sent a taxi to pick me up and got me a taxi to the station. He lived in East Hertford. The day after Easter, I’d walk on from The Stores to the station and pay 9d (ninepence) for a child’s fare to Stevenage to see my Uncle Harry and Aunty Edith. They had a nice council house in Stevenage; it was like ours but quite a big bigger. I spent Easter with Harry, and the Summer Holidays with Teddy. I made my way round the family. Before electrification of the passenger trains arrived in June 1959, they were steam-hauled locomotives that ran on coal. They had 1st, 2nd and 3rd class – 1st class were for the middle class & rich people while 2nd + 3rd were for the ordinary working class/poor people. Before I went to the platform, I went into the station office and paid 9 pennies fare to Hertford North (pre-1951) and then 1 shilling child’s fare to Stevenage then on to Hertford North (post-1951). The train left at 9AM promptly, and the queue was often short so I spent about 5 minutes queuing to buy my ticket then I went up along the footbridge then down to Platform 4 ready to catch my train. As the train arrived I ran to 2nd class and then sat in the 1st or 2nd compartment, not giving a care in the world what the normality was in which you sat in a train compartment. Behind the little compartments was a corridor in which you could look out the windows and just stand out there if there were no available seats to sit on. There was an attendant in every train carriage which would help you if problems arise. Riding on steam trains always incurred a very bumpy ride for some reason which I don’t know, after electrification began in 1959 the journeys became a lot more pleasurable! Mum and Dad, to my knowledge, never used the trains when I was growing up. It was always just me. The first time they used a train as I remember was when I moved to Barnet and they came down Christmas 1968 as they didn’t renew the tax on their car, so they took the train instead. They departed at Welwyn Garden City and got off at Hadley Wood, where I picked them up in my little Mini from. After we went up to Yorkshire, Mum & Dad used to drive up to our house. When we returned to the Garden City in 1976 all I remember them doing is driving, so I guess the trains weren’t well used by my family except from me. This page was added on 28/09/2015. I was born in WGC in 1958, and my parents lived in Fretherne Road (one of the houses demolished when they extended the shops along that road). My earliest memory of the station was being taken along their by my grandad (Harold Pontefract, then living in Handside Lane, but one of the very earliest residents in WGC, who worked for the original company). We went into Woolworths (just by the station then), bought an ice cream, and then sat on a porters trolley on the platform watching the shunting in the goods yard – all steam engines of course as this must have been 1960ish, as we moved to Templewood in 1961. Michael, it’s nice to know someone else remembers the old station before it was absolutely ruined by the Howard Centre. I went to Barnet in July 1967, but I had got there by car. Always drove up to Welwyn Garden – never took the train cause we took Mum and Dad shopping then went to eat at the Parkway Restaurant. They didn’t renew their car tax in Christmas 1968 so they took the train – I remember them saying how cheap it was. I personally have no recollection of what the train fares were as I never did paid the train fare to Welwyn Garden, so I make no comments there. The platforms are as you say above. An interesting post George. When i first rode on a diesel train from WGC up to Kings Cross and back with my dad which was around June/July of 1967 i recall the adult ‘Day Return’ fare from WGC at that time was 3 old shillings & 6 pence. I have posted a number of posts of railway interest on this site before and for the record the ‘Welwyn Flyover’ at the south end of WGC station was constructed during 1973 construction starting around May of 1973 and was completed by the end of the same year (1973). From memory the single line track was ‘layed in’ over the flyover on completion of the construction of the flyover at the end of 1973 but the ‘ballasting of the track’ wasn’t completed until about January or February of 1974 with the first trains using the flyover sometime during the first half of 1974. With regards to the platform numbering at WGC station as already stated before platform no.1 was originally the ‘Luton line platform’ along with platform no.2 being the northbound platform for the Stevenage & Hitchin direction. Across the footbridge on the other two platforms platform no.3 was the southbound platform for the Hatfield & Kings Cross direction and platform no.4 was the ‘Hertford line’ platform although during the 1960s & 1970s some local passenger trains going southbound towards the Hatfield & Kings Cross direction sometimes started from this platform. At some date in more recent years the platform numbering has been ‘reversed’ so now the old platform no.1 is now platform no.4 and so on.